Something crashed near Roswell, New Mexico, 68 years ago. The first military authorized press release stated, “RAAF (Roswell Army Air Field) Captures Flying Saucer On Ranch In Roswell Region.” That’s right, the military was the first to indicate it was a flying saucer. The military later revealed that this wasn’t a simple weather balloon, but an aircraft used for clandestine purposes — part of the Army’s top secret “Project Mogul”— to monitor atomic weapon testing in the old Soviet Union. The military also claimed that crash test dummies may have been mistaken for ETs. But that explanation only stirred the controversy. We went out to the scene of where the crash was and started picking up the debris. It’s almost indescribable. It’s not the kind of material I’d ever seen in my life, nor have I seen it since. There were various types of materials which I couldn’t identify. There were little members that looked like they were made of wood, but it wasn’t wood and it had some kind of writing or hieroglyphics that I couldn’t decipher and nobody else could. It was flexible, but you couldn’t break it and you couldn’t burn it. Also, I found a piece of metal which was about the thickness of the foil in a pack of cigarettes. But the amazing part about it was you could put it on the ground, hit it with a sledge hammer and you couldn’t even put a dent in it. That astounded me and I knew it was nothing from here. I was convinced it was not from anywhere on Earth and I’m still convinced of that. I had brought a counterintelligence man with me in a staff car plus a pickup truck. We got everything we could into that and I sent the agent back to the base. Then I filled up my car with stuff. By the time I got back home, my wife said, ‘What happened to you? There’s been a bunch of news reporters out here, wanting a picture of you.’ And I said, ‘For what?’ And there had been a public relations officer with them. He said, ‘From what happened, your husband will be very popular by tomorrow morning.’ So that’s how it all started. What amazed me most of all was the weightlessness of all this material — it weighed nothing. I found one piece of metal — supposedly metal — which was about a foot wide and about two-and-a-half feet long. When I got back to the base, we [Marcel and several enlisted men] brought it all into a briefing room and set up a whole lot of tables there. One of the men said, ‘Let me see if I can put some of those parts together, to see what the thing might have looked like.’ He came back later and said [he tried but couldn’t do it]. I consulted my CO [commanding officer], who said, ‘You better fly the thing to Wright-Patterson Air Field [Ohio]. So, we loaded up the whole thing — which was not a whole lot of material — onto a B-29. We had only picked up one small fraction of what was out there. It was scattered over such an area about three-quarters of a mile long and several hundred feet wide. We’d been there all day, picking up the fragments. Gen. Ramey told news reporters this was nothing but a crashed weather balloon, but I do know this: later on, Ramey wanted to cover his statement up, because he didn’t know, himself, what it was. I went back to Roswell to resume my duties, but what they did at Carswell was to make a mock display with a battered weather balloon and they let the press take pictures of that. The whole thing was a cover-up to begin with and that was the last I heard of it. I know it was not a weather balloon and I’d swear it on the biggest bible. It wasn’t a missile or any part of an aircraft that we know of. To mark the crash anniversary, Michael Donovan of OuterPlaces.com joined us on the HuffPost Weird News Podcast to discuss Roswell’s unanswered questions. Two years ago, Donovan was standing in the Roswell crash debris field along with Dr. Jesse Marcel Jr., a highly decorated military flight surgeon. “It was a moving experience because we’re out on the site and this large thunderstorm was moving toward us — you could see lightning flashing — and he’s standing there with his Iraq war veteran hat on and said, ‘This is amazing. Sixty-six years ago, my father was standing on this very site,'” said Donovan. Donovan says his belief in UFOs and a possible cover-up surrounding the Roswell UFO incident never gets in the way of his work — which includes co-designing the Ronald Reagan Presidential Library. “No, not at all. It goes back to the idea of being on a quest, being a problem-solver, and that’s what designers do. We solve problems. In the reading of science fiction, you begin on a path to discovery. That’s what we do every day and it’s really that kind of interest — learning new things — that put me on the path that I’m now on, relative to OuterPlaces.com. 1) What exactly crashed there in 1947? Was it a weather balloon, high altitude spy device, extraterrestrial craft? 2) Did the military switch materials that Maj. Marcel brought back from the debris field and, instead, allow the press to take pictures of an actual battered weather balloon? 3) If the crash site debris wasn’t really a weather balloon, where did the real stuff end up? 4) Why would the military decide to even issue a press release about a captured flying saucer? 5) Related to the above question, why would the military suddenly change the story from flying saucer to weather balloon? 6) Why did the military hire a local Roswell mortician to make child-sized caskets following the UFO debris retrieval? 7) Why did Jesse Marcel Sr. wait more than 30 years before finally revealing his part in the Roswell UFO events? 8) If true, why would the U.S. government want to cover up such a monumental event as the crash of an alien ship? This weekend’s 20th Roswell UFO festival takes off full blast today with speakers giving their presentations at different locations simultaneously. If lectures don’t fit your fancy, there’s always the alien pet and alien costume contests and a UFO festival light parade to check out. It’s fair to say that something happened outside Roswell in 1947 that literally put the town on the map. The debris is long gone, but the reverberations have never stopped. Whatever it was, after almost 70 years, it still depends on whom you ask or what you read, and whether you believe them. 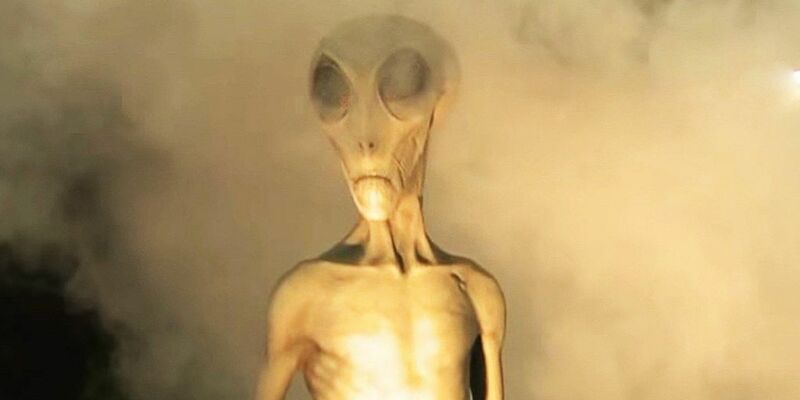 A 1997 CNN-Time poll showed that 80 percent of Americans think the government is hiding information about the existence of alien life forms, and nearly two-thirds of the poll respondents believed that a UFO crashed outside Roswell in 1947. We might not be able to prove the existence of alien life, but our producer Katelyn Bogucki is out of this world and so is our editor Jorge Corona.